The waffle weave towel that boasts a lovely satin edge! 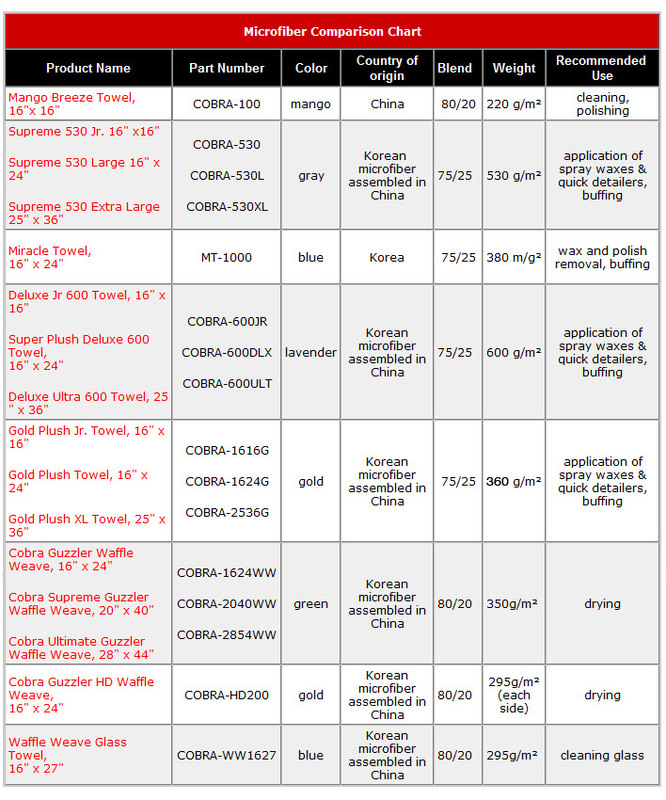 Other detailing towels just can’t live up to the perfection of microfiber, and its no surprise that Cobra has made them even better! In an effort to reduce occasional scratches caused by exposed stitching at the edges of the towel, The Supreme Guzzler, our newest drying towel, comes equipped with an elegant satin trim. The towel itself measures approximately 5.5 square feet, and is a gentle, mint-green wonder cloth that combines smoothness and absorption into one fine package. 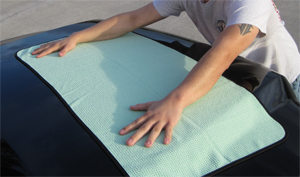 This towel is excellent for windshields, windows, rear view and side view mirrors. 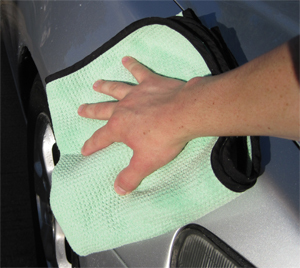 So gentle and non-abrasive, these towels are ideal for drying clear coats, glass, and chrome to a streak-free shine. With the new satin trim on your side, you can be assured that your paint will be 100% safe from scratches. The special, 80/20 waffle weave found in The Supreme Guzzler is a technological breakthrough that enhances absorbency and ensures the highest levels of performance. In fact, this new waffle weave fabric is 20% thicker than our original waffle weave towels. These incredible towels have limitless uses - clean, polish and shine with the streak-free perfection you’ve only dreamed of! New, upgraded blends of advanced microfiber make these towels and cloths the preferred choice for detailing pros and auto enthusiasts everywhere! An outstanding blend of over 220,000 strands of fiber per square inch of fabric, combined using a superior weave, ensures excellent cleaning results with incredible absorption capacity. The remarkable microfiber strands carry a positive static charge at all times, which attracts dust and other particles like a magnet. Once lifted from the surface, dirt particles become trapped within the network of fibers. Caring for your waffle weave products couldn’t get any simpler; toss them into your machine with Pinnacle Micro Rejuvenator . Be sure to wash all microfiber products separately from your regular laundry, because waffle weave towels will capture all the lint with their powerful, static charge. Never use fabric softener with any microfiber product, it will reduce the positive charge and decrease the effectiveness of the product. These fabrics are so light they dry in 1/3rd the time of conventional cloth. The Supreme Guzzler is just one step in a paint-safe detailing regimen. The first step is washing with Pinnacle Bodywork Shampoo . This lubricant-rich formula will allow gritty particles to slide off the paint surface without scratching. Wash from the top of the vehicle down, rinsing your wash tool frequently. For a final rinse, allow the water to flow freely from the hose from the roof of the vehicle. The water will sheet off the panels, leaving the vehicle mostly dry. Use The Supreme Guzzler to remove the remaining moisture.